‘‘Novo Nordisk has been able to further strengthen its type 2 diabetes (T2D) portfolio today with results that an oral formulation of the drug has demonstrated statistically improved reductions in weight and HbA(1c) versus a placebo in T2D patients. The drug, which was approved in the US under the Ozempic brand in February this year, is administered as a once-weekly self-injectable. Reformulation of the drug as an oral pill is likely to be well received by patients and physicians, and could help cement the drug as one of the leading medications in the T2D treatment landscape. ‘‘The T2D drug pipeline is very strong, and there is set to be significant growth in the overall market size during the next five to ten years. As a GLP-1 receptor agonist, semaglutide faces competition from an array of other injectable drugs, including Novo Nordisk’s own blockbuster, Victoza. The convenience of oral administration could therefore provide semaglutide a competitive edge in a burgeoning market. 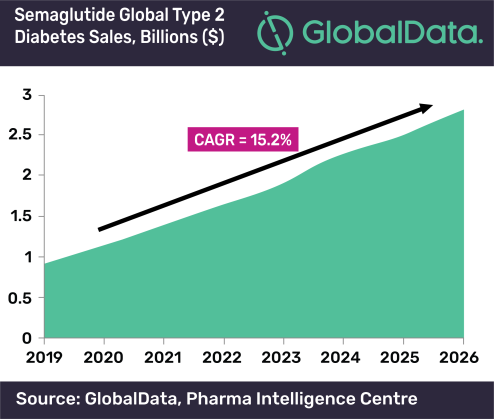 GlobalData expects this to help drive the combined semaglutide brands to blockbuster status, with an estimated $2.8 billion in T2D sales by 2026.